With so many people resolving to make their homes more energy efficient in the new year, we thought it would be helpful if we gathered up some tips for making the switch. 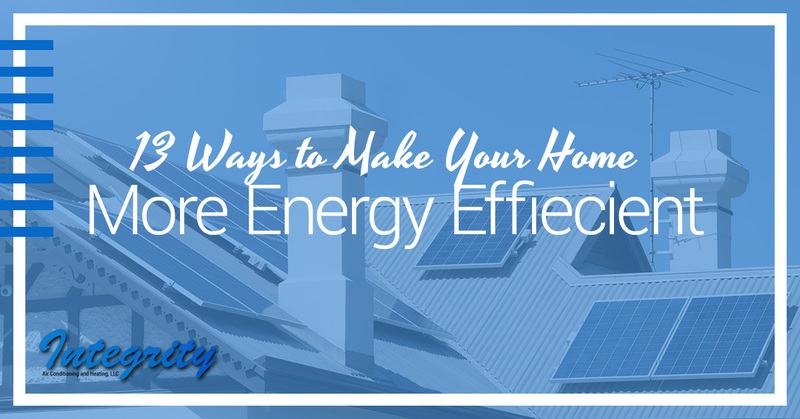 In many situations, the changes are incredibly easy, but their effect on your energy bills make it worth it. Is your heating and air conditioning system energy efficient? Call Integrity AC and Heating today to update your system and start saving money! This is possibly the easiest change to your everyday life that you can make. Now, we’re not telling you that you need to turn your home into an ice box. All you need to do is lower your thermostat by about 10 to 15 degrees while you’re not at home. You’ll be consuming less energy, and you won’t lose any comfort. The Department of Energy reports that, by doing this, you can save five percent to 15 percent on your energy bills annually. That adds up! Consider installing a programmable thermostat to do this automatically so you don’t even have to worry about fiddling with the thermostat before work in the morning. It doesn’t take that much room in a backyard to start a compost pile. Making your own compost is as easy as keeping a pile or container with organic waste that decomposes over time. By using fruit and vegetable waste, you don’t just make valuable fertilizer for your lawn or garden, you’re also reducing the amount of trash you send to the landfill. Plus, with that fertilizer, you can begin growing your own vegetables and fruit to save money on groceries. Standard showerheads have a flow rate of about five gallons a minute. You can improve your water efficiency and reduce bills by switching to a low-flow showerhead, which has a flow rate of less than three gallons per minute. There’s no reason to use more water than you actually need, so this is a great way to cut down on usage. Your home could have air seeping outside, essentially wasting that energy and increasing the workload for your HVAC system. Seal the frames around your windows with weatherstripping to cut down on draftiness. Use silicone caulk on any cracks that have developed in your drywall. You can also apply a sheet of shrink film to your windows to prevent air leaks. Sealing up air leaks and cracks is a cheap and easy way to reduce your energy bills. The EPA (Environmental Protection Agency) has reported that the average household can reduce their utility bills by about $170 a year, just by adjusting the amount of water they use on a daily basis. Avoid running water when you brush your teeth or shave. A shower uses much less water than a bath, with showers using about 17.2 gallons compared to a bath using nearly 75 gallons! When you run the washing machine, make sure it’s a full load instead of half. You’ll get more clothes washed at the same time, reducing the amount of water that would be needed for two half-loads. Starting in 2014, production of 40-watt and 60-watt incandescent light bulbs came to a halt, while 75-watt and 100-watt bulbs had already been phased out. Incandescent bulbs were invented a very long time ago, and unfortunately, were not designed to be very efficient. With Halogen, compact fluorescent, and LED bulbs becoming more common and less expensive, there’s no reason not to replace the energy hogging incandescent bulbs in your home. As a bonus, all three energy-efficient bulbs also have a much longer lifespan than incandescent bulbs, meaning you’re not going to have to pull out a ladder to replace them nearly as often. One of the biggest drains on a home’s energy is phone and battery chargers that are plugged in, but aren’t being used. It’s reported that an average phone charger consumes about 0.26 watts of energy when it’s not in use, and 2.24 watts when it’s actively charging your phone. While one charger being plugged in isn’t going to have that great of an effect, when multiple chargers are left plugged in, they can account for up to 10 percent of your energy bill. Unplug the charger when you’re not using it and your wallet will thank you for it. When 90 percent of the energy your washing machine uses is dedicated to heating the water up, only 10 percent is used to actually run the washer. By using either cold or warm water instead, you’re massively reducing the amount of energy used by your washer. Most clothes don’t get cleaner with hot water than they do warm or cold water, so it’s not even worth the waste. This is a bigger step than the others we’ve listed, but it helps a great deal. When you add insulation to your attic, you can seal air leaks and reduce your cooling and heating costs massively. When you’re really serious about getting energy efficient, this is a great step to take. Another big-ticket proposition to make your home efficient for years to come is installing a solar energy system. Many homeowners have started to use solar panels to heat hot water and provide electricity for their homes, which hugely reduces their energy bills. When you install solar panels, you may also qualify for annual tax incentives as well. This is really the improvement that pays you back. While you may already have an energy-efficient front or side door, adding a storm door gives an extra bit of protection from weather year round. With low-emissivity glass or a protective coating, storm doors can cut down on energy loss by up to 50 percent, according to the Department of Energy. A good storm door can last anywhere from 25 to 50 years and are relatively inexpensive for the amount of good they can do. When you have a professional energy auditor come survey your home, they will be able to point you in the direction of inefficiencies and wasted energy you likely hadn’t noticed. They will be able to pinpoint problem areas, provide advice, and help you understand savings opportunities. This is highly recommended when you want to make a long-term action plan for energy efficiency. Getting an annual tune-up on your HVAC system will ensure your furnace and air conditioner are working properly and efficiently. When an HVAC system isn’t working properly, it can waste a lot of energy and cost you a lot of money. Not only that, if an HVAC system is damaged, you’ll have the cost of replacing it to contend with. When an HVAC professional performs a tune-up on your system, they will ensure all connections in the system are tightened, air leaks are sealed, parts are lubricated, and coils are cleaned and operational. Making the change to a more energy efficient household isn’t just good for you, it’s good for the environment, too! If you want to get your HVAC system tuned up, install a programmable thermostat, or just ensure your home is free of air leaks, call Integrity AC and Heating today! We’re Phoenix’s HVAC gurus, and we want to help your house feel like home.